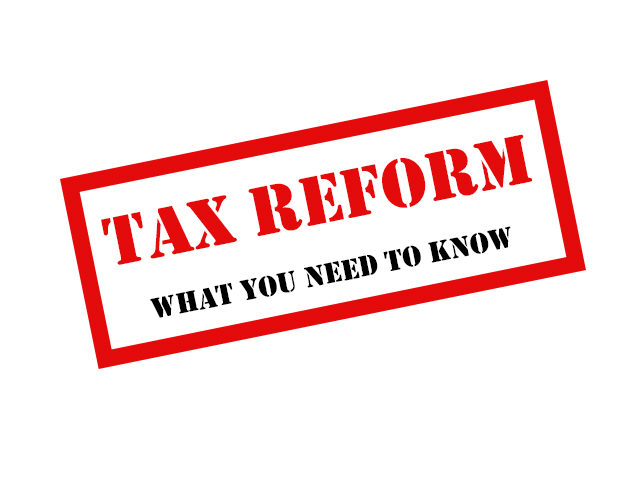 On December 28, 2017, we posted some information on the new tax reform bill,H.R.1, the Tax Cuts and Jobs Act, passed by Congress on December 20, 2017. Many of you are concerned about how the new bill will affect you—especially if you normally use itemized deductions (greater than the standard deduction) on your personal return, and if you have pass-through income from business entities. The standard deduction and exemption deductions were essentially “combined” such that 2018 tax returns will no longer have an exemption line item. Instead, a larger standard deduction is now in place: $12,000 for single taxpayers; $18,000 for head-of-household filers; and $24,000 for married individuals filing jointly. Deductions for non-business state and local taxes (including property tax and, for us Texans, sales tax) will be limited to a maximum of $10,000 ($5,000 if married filing separately). For example, if you have property taxes of $8,000 and a sales tax deduction of $3,000 (or $11,000 for total taxes paid), you will be limited to deducting only $10,000 for 2018 if you itemize. Miscellaneous deductions on the Schedule A – Itemized Deduction have been eliminated beginning in 2018. Miscellaneous deductions in the past have included your un-reimbursed business expenses, investment advisory fees, IRA fees, union dues, safe deposit box fees, etc. IMPACT: Depending on your personal situation, without miscellaneous deductions and given new limitations on property/sales taxes, you may find that the standard deduction is now the higher amount, and thus will be the more advantageous deduction in future years. Some good news: The child tax credit has been increased from $1,000 to $2,000 per qualifying child (essentially dependent children under age 17), and the adjusted gross income threshold that begins to phase out the credit has increased from $110,000 to $400,000 for joint filers; and from $75,000 to $200,000 for single filers. This is a significant increase over recent years–and it might offset any tax deduction lost from the elimination of the exemptions deduction. These are only a few of the tax law changes; we have posted more extensive articles from the Journal of Accountancy on our website at www.McIlvain.net/News . In addition, you can click here to view our two-page white paper for Individuals. C Corporations now are taxed at a flat 21% (not graduated—just flat 21%). With respect to pass-through entities, there are several important things to note. If considered a “qualified” business, a 20% tax deduction can be used to offset pass-through income, subject to other criteria. Under certain income levels, a “non-qualified” business can utilize the 20% deduction, subject to other criteria. This calculation is one of the more complex provisions in the H.R.1 tax reform bill. Businesses that are excluded (unless under certain income thresholds) are service-related businesses such as CPA firms, attorneys, doctors, consultants, financial advisors, and service businesses where the principal asset is the reputation or skill of one or more of its employees or owners. “Qualified” pass-through entities (such as S Corporations, Partnerships, and Schedule C sole proprietors) that are eligible for the 20% deduction must compare the deduction to other criteria to determine if this tax deduction is further reduced, as there are limitations to the straight 20% calculation that relate to wage percentages and business assets percentages of the company. Further, once the deduction has been determined at the business level, other limitations may reduce the deduction based on certain income levels of the individual taxpayer. IMPACT : Needless to say, the impact on each taxpayer’s individual situation depends on many factors, both from the pass-through entity and the individual’s income sources and amounts. We can analyze this for you and discuss your business goals/plans in light of possible entity structure changes or additions. Converting a business to a C Corporation to take advantage of the 21% tax rate is an option, but it requires some thoughtful evaluation. One factor to consider is how you will be taking out profit from the company. For S Corporations or partnerships, this is usually done in tax-free distributions, but C Corporations have a 15% dividends rate on distributions. In addition, meals provided for work-related events and on the employer’s premises that were previously deducted at 100% are now deductible at only 50%. We know this kind of sweeping reform can be a lot to digest. But rest assured, as we continue to receive IRS interpretations and guidance on the Tax Cuts and Jobs Act, we will be well positioned to provide you with more certainty in tax planning for 2018 and subsequent years. We encourage you to to check our website for additional “business white papers” that will be added in the coming weeks. We’re committed to learning more specifics as they unfold, and we look forward to working with you in this new tax era.